I am interested in hearing your explanation if you don’t mind. Skushno posted this question in the Introductory thread, but I think it’s important enough to create a separate thread for discussion. Sure, I’ll go into more detail about how the No Dealing Desk (NDD) works. You’ll often hear NDD also referred to as Straight Through Processing (STP). First, I’ll explain how the quotes are determined, and second, how trades are offset. How are the quotes determined? FXCM receives pricing and liquidity from 10 banks. So there are 10 separate prices being quoted on the bid side (sell price) and 10 separate prices being quoted on the ask side (buy price). The execution engine on our backend shorts the prices and displays the best bid/ask on the trading platform. Here’s a short example using two banks and without fractional pips to make things simple. Let’s suppose Bank A and Bank B are each quoting prices for GBP/USD. Here’s what each bank is quoting. The best price being offered by the banks on the sell side (you sell and bank buys) is at 1.5025 by Bank A, and the best price being offered by the banks on the buy side (you buy and bank sells) is at 1.5026 by Bank B. Therefore the bid/ask is 1.5025/1.5026. There’s a 1 pip spread between the buy and sell price. FXCM then adds a fixed mark-up which is our compensation. Assuming there is a pip added to the bid/ask means the final price displayed on the FX Trading Station is 1.5024/1.5027. You then see a 3 pip spread. This process is occurring very quickly and with 10 separate feeds to sort through. It’s mind-boggling sometimes to think of how fast it occurs. To give you an idea, take a look at a tick chart from Marketscope showing tick history in EUR/USD over a 3 second period. In the screenshot below, there were 18 separate price updates. This is also why the spread is variable. As banks compete for the best price, spreads will fluctuate. Whoever has the best price, gets the volume. How does NDD work when placing a trade? Continuing with the previous GBP/USD example, let’s say you want to buy GBP/USD and decide to click on the price 1.5027. When you submit the order, the order is sent to FXCM for the price 1.5027 and FXCM routes the order to Bank A offering to sell at the price 1.5026. If the order is accepted, Bank A has a short position at the price 1.5026, you have a long position at the price 1.5027, and FXCM has gained 1 pip in revenue. Each order is offset in this fashion individually to be offset. The trades are not aggregated like you would have with a market maker so at no point is FXCM taking on the risk of trading against clients as a market maker or dealing desk would take. We can take the example one step further. If multiple orders are submitted or are waiting for the same price, there is then a queu for the orders to be executed. There is also a limited amount of liquidity at each point. For example, Bank A may be offering to sell 1 million notional amount of GBP/USD at the price 1.5026. If there is 1.2 million notional of traders orders waiting to be executed, that means 200k worth of orders will be slipped or cancelled depending on whether the trade is setup At Best or Market Range order. For this example, let’s say the order is submitted as an At Best market order. Your order arrives at Bank A, but the price 1.5026 is no longer available. The order is then re-submitted at the next best available price which happens to be 1.5027 from Bank B. The trade is executed so Bank B has a short position at 1.5027, you have a long position at 1.5028, and FXCM has gained 1 pip in revenue. Despite the slippage on the trade, FXCM’s revenue remains the same. If the market continues to rise, your long position becomes more profitable and the banks short position turns into a loss, and viceversa. If you close the trade at a $200 profit, the bank is booked with a $200 loss. If you have a $200 loss, the bank has a $200 profit. Your profit/loss doesn’t have an impact on FXCM’s bottom line. NDD eliminates the risk of traders being profitable, and eliminates the conflict of interest whereby it’s in the best interest of a dealing desk for its clients to lose. In retail trading, the broker will be the counterparty to your trade whether using NDD or dealing desk execution. The reason for this is because you don’t have credit lines setup with the banks. If something goes wrong or there’s a problem to settle, the bank will come to FXCM rather than knocking on your door. The forex market is decentralized so everything is based on creditworthyness and relationships. What matters in terms of your counterparty is how then manages that risk (how the trade is offset). Is the broker taking the other side of the position and thereby running the risk or trading against clients, or is the broker offsetting trades immediately eliminating the risk and becoming neutral to a trader being profitable. NDD also gives you the benefit of being anonymous. Why do you get re-quotes or order restrictions through a dealing desk but not with NDD? A dealing desk can identify individual traders and change tactics accordingly. On NDD, all orders goto the banks labelled as submitted by FXCM so they can’t single out individual orders or traders. Everyone plays by the same rules. I know it’s a long post, so thanks for reading. If anything is unclear or you have additional questions. Please feel free to let me know. Additional Note: For full disclosure, FXCM Micro accounts are currently executed through FXCM’s dealing desk. Reason for this is because only 2 of 10 banks were previously accepting micro lots via NDD execution. This will be changing to NDD in the upcoming months. I appreciate your informative posts, they’re adding great value to the forum. I’m still confused with the counterparty part. Also I didn’t understand what’s the difference of a market maker being the counterparty, compared with a NDD. My third question would be what’s the difference between and ECN and NDD, and what kind of advantages could you offer compared to an ECN. When you place a trade and the order is executed, there are two positions open on our books. So two sides to every trade. You have a trade with FXCM (Trade 1) and FXCM has a trade with the bank (Trade 2). So the orders (Trade 1 and 2) are back to back offsetting each other eliminating the risk on FXCM’s side of your position moving into a profit or loss. This occurs individually for every trade executed via NDD. Does that fully answer the how part of your question? The trade will only be opened if Trade 2 (between FXCM and the bank) can be completed. In both cases, if you look at the books for your trades, the counterparty is your broker. Both methods have Trade 1 completed: you have a trade with your broker as the counterparty. What happens next is what determines whether the broker is acting as a market maker or use NDD/STP. [U]Market Maker:[/U] A market maker stops at Trade 1. They may take the opposite side of the position without hedging the risk or they may wait to aggregate and offset trades in hopes of getting a better price. This is often why you may see a market maker offering tighter spreads than the market or fixed spreads. They’re counting on either 1) you losing money or 2) having the dealer offset the trade later at a better price. In the end, either method will make up for the initial loss in spread. There is a 3rd option. It is possible that two trades could come in at the exact same time for the exact same amount, but this doesn’t happen very often. [U]NDD/STP:[/U] The difference with the NDD/STP setup is that the risk of being the counterparty in step 1 is offset by step 2. When you submit the order, we first communicate with the bank and say “Bank A can you take this order?” if they say no then step 1 never occurred. If yes, Trade 2 is open along with Trade 1 and you see the confirmation on the FX Trading Station II. With NDD, you are a price taker. When you create an entry order, you have to wait for the price to be quoted before your order goes into execution. With an ECN, you can be a price maker in addition to taking prices. Simplified… you can act as a market maker. If you’re willing to give a better price than what’s being quoted, that’s what everyone else will see, and whoever requests that price will get filled for the amount you are offering. Trading on a true forex ECN would also likely require credit lines through prime brokers. FXCMPro is an example of a true forex ECN. Let me know if anything is unclear. See everyone tomorrow! Well thank you! Great explanation. All clear now. Thanks for taking the time to respond. It’s very much appreciated! [li]NDD brokers provide access to the interbank market without passing orders through the dealing desk. [li]NDD brokers work with their market liquidity providers, primarily banks to get better competitive bid and ask prices. [li]With true NDD brokers there are no re-quotes on orders and no order confirmation. This allows traders to trade during news time with no restrictions on trading. [li]NDD brokers charge a commission for trading OR increase the spread and make trading commission free. From what I just read, it seems FXCM meets all the following requirements. Am I correct? From my understanding, NDD brokers can either be [B]STP[/B] or [B]ECN+STP[/B]. [B]STP broker[/B]s send orders directly from clients to the banks. The more banks, the better the fills for the clients. You mention you have 10 banks as liquidity providers. Can you specifically name those banks? [B]STP+ECN brokers[/B] additionally allow client orders to interact with other client orders. In a nutshell, there’s a marketplace where all its participants (banks, market makers and individual traders) trade against each other by sending competing bids and offers into the system. Everyone interacts inside the system and gets the best offers for their trades available at that moment… All trading orders are matched between counter parties in [I]real-time[/I]. [li]Aside from FXCM Pro, your “regular” FXCM is [I]not[/I] an ECN broker? [li]How does an ECN broker make money? NDD brokers provide access to the interbank market without passing orders through the dealing desk. The more correct statement would be the orders are routed straight through to the banks some of which comprise the interbank market rather than the dealing desk offsetting those trades directly. Reason I say this is because the interbank market is not a centralized location or exchange. You can also think of the interbank market as a whole as being comprised of tiers. The top tier of the interbank market is comprised of very large banks that trade amongst each other via platforms such as EBS and Retuers Dealing. This is the inner circle trading with tiny spreads. As you start to drop down in tiers you get other large banks, some retail forex brokers, large multinational corporations, and so forth. As you get further away from the inner circle or top tier you have less clout so your prices worsen meaning your spread increases. At the bottom of the totem pole on the outermost tier, you have Joe the Plumber exchanging money at the airport on his way to Tahiti paying a 500 pip spread or more. NDD brokers work with their market liquidity providers, primarily banks to get better competitive bid and ask prices. Competition improves the spreads. The banks in general like retail trading volume. Whoever has the best spread gets the volume. The more banks on the platform, the more competition. The banks have also found ways to edge their way up from by offering fractional pips to increase their chances of being the tightest. Also, remember the banks offer different spreads to different tiers, so the relationship your broker has with the banks in the inner circle will determine the spread and liquidity they provide to traders on the brokers platform. With true NDD brokers there are no re-quotes on orders and no order confirmation. This allows traders to trade during news time with no restrictions on trading. This is correct. There should be no re-quotes on orders or restrictions on trading if there is true NDD. NDD brokers charge a commission for trading OR increase the spread and make trading commission free. Confidentiality agreements restrict us from disclosing this, but I hope that we will be able to eventually. I’m all for transparency. If you made a list of the 10 largest banks in the world trading foreign exchange, it would be good bet that most if not all are on our platform. STP+ECN brokers additionally allow client orders to interact with other client orders. In a nutshell, there’s a marketplace where all its participants (banks, market makers and individual traders) trade against each other by sending competing bids and offers into the system. Everyone interacts inside the system and gets the best offers for their trades available at that moment… All trading orders are matched between counter parties in real-time. While I guess an NDD model could be setup to match traders orders first before attempting to offset it with a bank, it doesn’t happen very often that a trade for the same price and size arrive at the exact same time. The FXCM NDD execution is not a true ECN and neither do we claim it to be. The biggest benefit is that it removes the conflict of interest between FXCM and its traders. How does an ECN broker make money? If you have a true ECN, it will make money through commissions. This isn’t to say that the reverse is true, if a broker charges commissions then it’s an ECN. FXCM’s active trader platform charges a commission yet it is not a true ECN. You simply pay a commission instead of having the spread marked up. Can the same games that are played by dealing desks be played on the ECN? Thanks for joining in on the thread! It’s more difficult for an NDD/STP model to be manipulated because there’s competition from multiple market makers. Having multiple competing banks ensures that no one bank can control either the spread or market movement. If one bank decides to increase their spread, there are multiple other banks minimizing the impact. Some of the most common things you’ll notice on a dealing desk are re-quotes and order restrictions. Re-quotes don’t occur on NDD because your order will simply be passed to the next bank if the first one isn’t willing to accept the trade. The order will be filled at the next best available price or rejected depending on how you have the order setup. Neither are there any restrictions on stop, limit or entry orders with NDD. For example, you may see restrictions on how close you can set a stop, limit or entry order to the current market price. And during news events, the restriction on how close you can place the order may increase as well. Because of how it works, I wonder if it’s possible to trade minilots with this scheme, or just full lots are allowed? Mini lots can be traded with NDD in addition to standard lots. And shortly within a couple of months, the banks are scheduled to start accepting micro lots for NDD execution. Great thread! Thanks for the time and effort you have obviously put into answering all these questions. Some of the questions thrown at you have been extremely detailed and technical, and you have answered them in a clear and concise manner. Kudos, my friend! Great graph you have there. Incredible to think that nearly 80% of currency trading volume goes through [I](edit: 1 of the 10 banks mentioned)[/I] just 10 of the world’s largest banks. 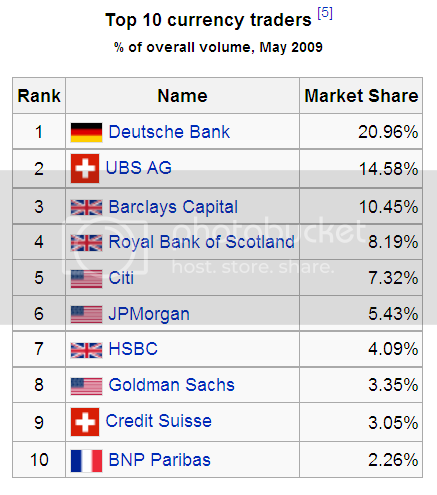 …Incredible to think that nearly 80% of currency trading volume goes through 1 of the 10 banks mentioned. I think you meant to say that nearly 80% of currency trading volume goes through just 10 of the world’s largest banks. Ooops, my wording was incorrect on that one. You posted exactly what I was thinking. Thanks for the correction Clint! We’ve created a video visually explaining how FXCM’s No Dealing Desk execution works. This is a not so serious question since I am currently not in danger of being in the following situation: Do dealing desk brokers actually ask clients to leave if they make too much money? Thanks for the question. I am not familiar with any brokers official policy closing an account; however, I do know that a dealing desk broker will sometimes list scalping as a prohibited strategy. That is why a trader scalping on a consistent basis may be placed on dealer intervention/referral whereby the dealer will manually confirm pricing for each trade. I won’t pass judgement on any particular trading strategies but it’s important to understand how it impacts the dealing desk brokers bottom line to see why they don’t allow it. I will explain in greater detail. Scalping is not allowed on most dealing desk platforms because the broker is often holding the other side of your trades. Scalpers create an abnormal amount of transactions, which generally come too fast for the dealing desk to properly manage the risk. In addition, profitable scalpers compound the issue for dealing desk brokers as the dealing desk can wind up holding several losing positions after the scalpers have already gotten out. For example, let’s say you’re trading the US NFP report which can cause the market to move dramatically within seconds. The number is released and it causes the EUR/USD to skyrocket higher. You decide to buy EUR/USD as the market shoots higher. By the time your order reaches the dealing desk, your trade may have already closed the spread and be in a profit. The market could be moving 10-20 pips per tick. Because the market is moving so quickly, you see your position has quickly closed the spread and is now profitable so you decide to close your trade for a quick profit. By having the trade profitable almost immediately and closing the trade within minutes/seconds, the brokers dealer does not have enough time to hedge your trade. They either have to eat the loss (your profit) or re-quote you a new price. If you consistently trade in the market direction during volatile market events you may receive a re-quote because the dealer is trying to manage the risk on the trade. On the flip side, if you are trading against the market move you will probably have no problem getting in or out of the trade. If you sell EUR/USD and EUR/USD is skyrocketing higher, the trade is opened at an immediate and likely quickly growing loss. You have done the dealers job for him/her . FXCM’s no dealing desk forex execution offsets (hedges) every trade immediately with one of several banks or financial institutions. This means we don’t have to worry about managing that risk, and there are no re-quotes. A pip markup is added to the spread (essentially a commission) which acts as FXCM’s compensation. We put together a trading guide detailing the differences between NDD forex execution and dealing desk execution. It goes into even more detail about scalping and how a dealing desk operates. It can be found here Portal - FXCM.com. I thought the point at which your order is opened/confirmed/a done deal is at the dealing desk? If the dealing desk decide to re-quote you, then you haven’t got a trade? Sorry if this is a stupid question.